Articles of agreement and convention made and concluded on the She-nah-nam, or Medicine Creek, in the Territory of Washington, this twenty-sixth day of December, in the year one thousand eight hundred and fifty-four, by Isaac I. Stevens, governor and superintendent of Indian affairs of the said Territory, on the part of the United States, and the undersigned chiefs, head-men, and delegates of the Nisqually, Puyallup, Steilacoom, Squawskin, S’Homamish, Stehchass, T’Peeksin, Squi-aitl, and Sa-heh-wamish tribes and bands of Indians, occupying the lands lying round the head of Puget’s Sound and the adjacent inlets, who, for the purpose of this treaty, are to be regarded as one nation, on behalf of said tribes and bands, and duly authorized by them. 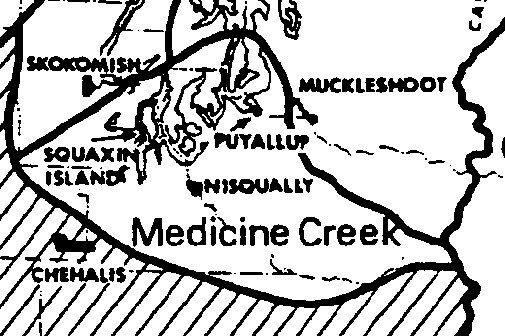 The said tribes and bands of Indians hereby cede, relinquish, and convey to the United States, all their right, title, and interest in and to the lands and country occupied by them, bounded and described as follows, to wit: Commencing at the point on the eastern side of Admiralty Inlet, known as Point Pully, about midway between Commencement and Elliott Bays; thence running in a southeasterly direction, following the divide between the waters of the Puyallup and Dwamish, or White Rivers, to the summit of the Cascade Mountains; thence southerly, along the summit of said range, to a point opposite the main source of the Skookum Chuck Creek; thence to and down said creek, to the coal mine; thence northwesterly, to the summit of the Black Hills; thence northerly, to the upper forks of the Satsop River; thence northeasterly, through the portage known as Wilkes’s Portage, to Point Southworth, on the western side of Admiralty Inlet; thence around the foot of Vashon’s Island, easterly and southeasterly, to the place of beginning. There is, however, reserved for the present use and occupation of the said tribes and bands, the following tracts of land, viz: The small island called Klah-che-min, situated opposite the mouths of Hammerslev’s and Totten’s Inlets, and separated from Hartstene Island by Peale’s Passage, containing about two sections of land by estimation; a square tract containing two sections, or twelve hundred and eighty acres, on Puget’s Sound, near the mouth of the She-nah-nam Creek, one mile west of the meridian line of the United States land survey, and a square tract containing two sections, or twelve hundred and eighty acres, lying on the south side of Commencement Bay; all which tracts shall be set apart, and, so far as necessary, surveyed and marked out for their exclusive use; nor shall any white man be permitted to reside upon the same without permission of the tribe and the superintendent or agent. And the said tribes and bands agree to remove to and settle upon the same within one year after the ratification of this treaty, or sooner if the means are furnished them. In the mean time, it shall be lawful for them to reside upon any ground not in the actual claim and occupation of citizens of the United States, and upon any ground claimed or occupied, if with the permission of the owner or claimant. If necessary for the public convenience, roads may be run through their reserves, and, on the other hand, the right of way with free access from the same to the nearest public highway is secured to them. The President may hereafter, when in his opinion the interests of the Territory may require, and the welfare of the said Indians be promoted, remove them from either or all of said reservations to such other suitable place or places within said Territory as he may deem fit, on remunerating them for their improvements and the expenses of their removal, or may consolidate them with other friendly tribes or bands. And he may further, at his discretion, cause the whole or any portion of the lands hereby reserved, or of such other land as may be selected in lieu thereof, to be surveyed into lots, and assign the same to such individuals or families as are willing to avail themselves of the privilege, and will locate on the same as a permanent home, on the same terms and subject to the same regulations as are provided in the sixth article of the treaty with the Omahas, so far as the same may be applicable. Any substantial improvements heretofore made by any Indian, and which he shall be compelled to abandon in consequence of this treaty, shall be valued under the direction of the President, and payment to be made accordingly thereof. The aforesaid tribes and bands acknowledge their dependence on the Government of the United States, and promise to be friendly with all citizens thereof, and pledge themselves to commit no depredations on the property of such citizens. And should any one or more of them violate this pledge, and the fact be satisfactorily proved before the agent, the property taken shall be returned, or in default thereof, or if injured or destroyed, compensation may be made by the Government out of their annuities. Nor will they make war on any other tribe except in self-defence, but will submit all matters of difference between them and other Indians to the Government of the United States, or its agent, for decision, and abide thereby. And if any of the said Indians commit any depredations on any other Indians within the Territory, the same rule shall prevail as that prescribed in this article, in cases of depredations against citizens. And the said tribes agree not to shelter or conceal offenders against the laws of the United States, but to deliver them up to the authorities for trail. The United States further agree to establish at the general agency for the district of Puget’s Sound, within one year from the ratification hereof, and to support, for a period of twenty years, an agricultural and industrial school, to be free to children of the said tribes and bands, in common with those of the other tribes of said district, and to provide the said school with a suitable instructor or instructors, and also to provide a smithy and carpenter’s shop, and furnish them with the necessary tools, and employ a blacksmith, carpenter, and farmer, for the term of twenty years, to instruct the Indians in their respective occupations. And the United States further agree to employ a physician to reside at the said central agency, who shall furnish medicine and advice to their sick, and shall vaccinate them; the expenses of the said school, shops, employees, and medical attendance, to be defrayed by the United States, and not deducted from the annuities. The said tribes and bands finally agree not to trade at Vancouver’s Island, or elsewhere out of the dominions of the United States; nor shall foreign Indians be permitted to reside in their reservations without consent of the superintendent or agent. This treaty shall be obligatory on the contracting parties as soon as the same shall be ratified by the President and Senate of the United States. In testimony whereof, the said Isaac I. Stevens, governor and superintendent of Indian Affairs, and the undersigned chiefs, headmen, and delegates of the aforesaid tribes and bands, have hereunto set their hands and seals at the place and on the day and year hereinbefore written. Isaac I. Stevens, (L.S.) Governor and Superintendent Territory of Washington. Ratified Mar. 3, 1855. Proclaimed Apr. 10, 1855. Historiography – The following is a sampling of statements made at the time of the fighting or by later historians (even a novelist). You make the call. Fellow citizens! War has existed for three months, and still exists. A war entered into by these Indians, without a cause; a war having not its origin in these treaties, nor in the bad conduct of our people. It originated in the native intelligence of restless Indians, who, foreseeing destiny against them, that the white man was moving upon them, determined that it must be met and resisted by arms. We may sympathize with such a manly feeling, but in view of it, we have high duties. The future will prove that this war has been forced upon these Indians against their will; and that too, by a set of lawless vagabonds for pecuniary and political objects and sanctioned by a numerous population that regard the Treasury of the United States as a legitimate subject of plunder. The Indians . . . have been driven to desperation by acts of cruelty against their people. Treaties have been violated and acts of barbarity committed by those claiming to be citizens that would disgrace the most barbarous natives of the earth. 6. From: Edmond S. Meany, History of the State of Washington. New York: The MacMillan Company, 1910. The governor later discovered that a mistake had been made in giving the Nisquallies an unsatisfactory reservation. On his recommendation that error was corrected. It was deemed honorable and essential that the government should endeavor to settle these questions with the Indians. It is altogether probable that the treaties contributed toward the causes of the wars that followed them. The Indians saw that the white men were coming to take their lands. These negotiations were proof of that fact, and the Indians simply endeavored to make one more stand against the wave of civilization thus threatening to engulf their old ways of living. The charge, made by some, that the wars were caused by Governor Stevens or his method of making the treaties, is both unfair and untrue. Hazard Stevens took says: In all his councils Governor Stevens took the greatest pains to make the Indians understand what was said to them. To insure this, he always had several interpreters to check each other and prevent mistakes in translation, and was accustomed to consult each the chiefs as to whom they wanted as interpreters.
. . . about the treaty he had made with the Nisqualli and the Puyallup at Medicine Creek. Then sent to Congress for ratification as soon as it was signed. Now he was having doubts about it. The reservations were too small. They were too heavily timbered. They weren’t well suited to the tribes they were meant for. I listened too much to Simmons and the other white settlers, he thought, to people who were blinded by their hunger for land. They see the Indians as something to be cleared out of their way like brush and trees. I let them put the Indian on bad land so they can have the good land for settlement, every last inch of it. In the beginning Gibbs saw that this would happen. I didn’t listen to him and he compromised. I should have listened. I should have talked more to the Indians. After the close of the Indian war it appeared that there was much dissatisfaction among the Indians with the Nisqually and Puyallup reservations both as to size, location and quality. At a subsequent meeting with the Indians new reservations, the ones they at present occupy, were assigned them to which they agreed. These selections were approved by the president and became their subsequent homes. Congress made the regular appropriations from year to year to carry out the terms of the treaty, and so far as the record goes, the government performed its part of the agreement. However, for a period of many years there was much corruption and inefficiency in the Indian service and during the war of the rebellion the currency depreciated so much that these several amounts were so much reduced as to be of but very little value to the Indians. The officers of the government have been severely criticized for the way in which this treaty was made. It has been claimed that the Indians were overreached, given very inadequate reservations, and otherwise imposed upon, that it was one of the contributory causes of the Indian war that followed. It is even claimed tat some Indians whose names were appended to the treaty as signers never made their marks at all, but were violently opposed to its terms, and that one of them went so far as to tear up his commission as sub-chief. It is true that the land assigned them was very unsuited to their needs. It is also true that at least three of the signers of the treaty joined the hostiles and were very active enemies of the whites in the war that followed. Whether or not any undue influences were used to induce the Indians to sign the treaty, and whether those signing all fully understood the terms of the treaty or not, it is quite possible that the influence of strong aggressive men of great will power and superior intelligence did cause some few Indians to make their marks who would not have done so under normal conditions. But with the large majority of the Indians there was a strong desire to settle conditions which were becoming somewhat strained. The Indians had a possessory right of occupancy and whites were coming in and settling down on their choicest lands, with no compensation having been given to them. They were peaceably inclined, felt friendly to the whites, wanted the matters settled and had confidence in the officers of the government, and believed that they were making the best adjustment possible under the circumstances. They therefore willingly assented, although probably not fully understanding all of the details. This as to the large majority, to which of course there were some exceptions. The inadequacy of the lands assigned them for their use as reservations is the most glaring evidence of imposition on their credulity. On this point it is but just to Governor Stevens to say, that with his scant knowledge of the Indians at the time, their conditions and habits, he had formed a plan to colonize them all on one o two large reservations farther down the Sound. 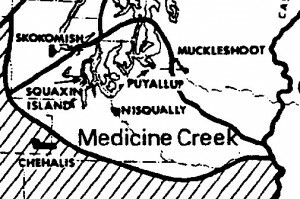 In the very next treaty made a month later with the Snohomish Indians, a large reservation of a full township or 36 sections was assigned them, with a proviso that other Indians might be allowed to move on to it, if thought best. While this arrangement was pending on his mind, it was not polite for him to suggest it to the Indians as a part of the first treaty. He did, however, as stated before, reserve the right to move them to some other place on certain conditions. He, therefore, only looked upon these reservations as temporary assignments and expected that their permanent homes would be somewhere else.